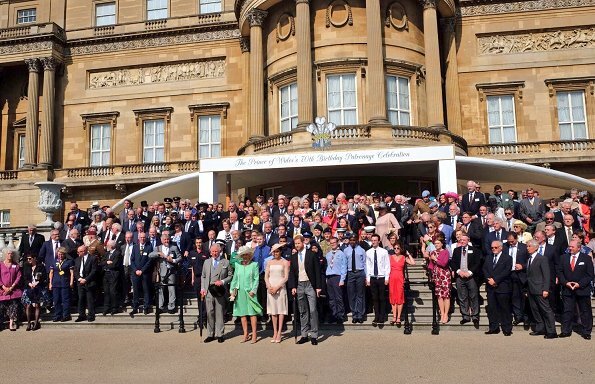 70th birthday celebrations of Prince Charles of Wales who is the first heir to the British throne began with a garden party held at the Buckingham Palace Garden. 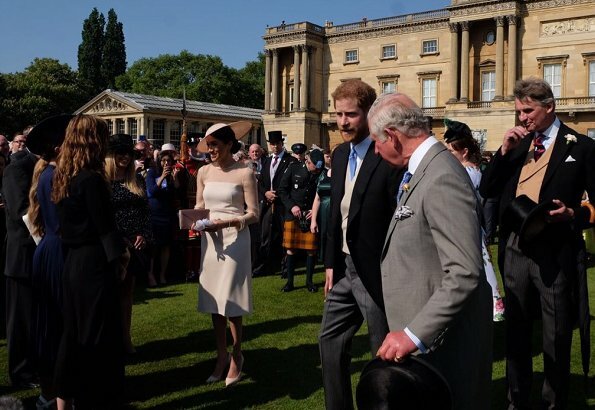 Prince Charles of Wales, Duchess Camilla of Cornwall, The Duke and Duchess of Sussex and more than 6000 guests attended that garden party hosted by the Queen. 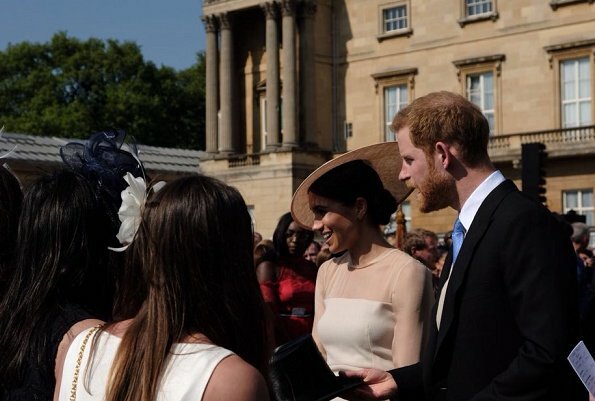 That was the first public appearance of Meghan Markle and Prince Harry since their wedding on May 19. 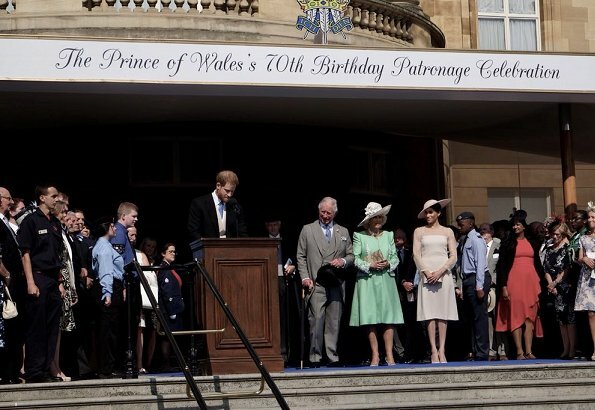 Prince Charles will be 70 years old on November 14, 2018. A sleek elegant look for her first official engagement as Duchess of Sussex. Love the hat and the chignon. She is perfect. Lovely choice of dress and accessories! Sieh an! Kaum verheiratet und schon trägt sie Strumpfhosen und hat die Haare ordentlich gemacht. Ja, ich bin etwas erstaunt. Mir fehlt da eine gewisse Frische. Ich will nicht hoffen, dass sie sich jetzt in eine pomadige Langweilerin verwandelt. Wie man es macht, ist es falsch. Wenn man jemanden nicht mag, hat man immer etwas zu kritisieren. Ich finde, eleganter geht es nicht mehr, sie ist wunderschön!!! Her pantyhose is too fair for the skin tone of her legs. the whole outfit is a tad big on her..she looks disguised. Her hands and legs are the same color. The dress fits perfectly - shoulder seams spot on. In no way does she look “disguised.” She looks like she has just married into the royal family and has begun her life as a duchess. I agree with the pantyhose, but I do not think that she looks disguised. She makes the dress lightness and grace. 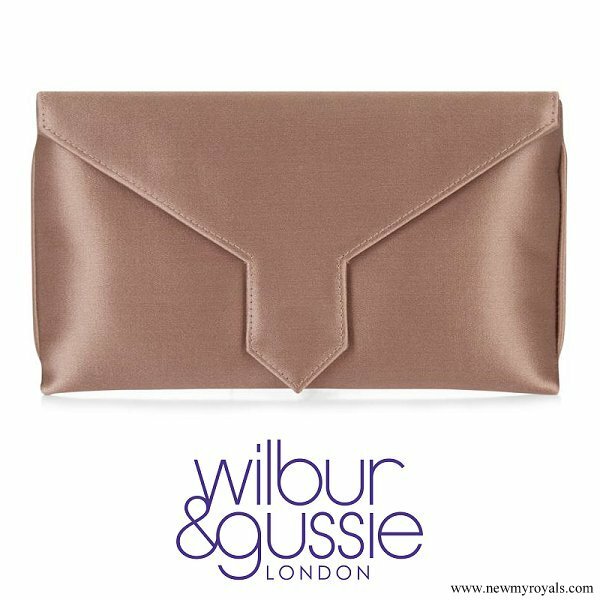 Fresh, fresh ...flattering colors, style and cut on the Duchess of Cornwall. You are so right! Pantyhose wrong tone, dress doesn't fit. And the neat bun.... so not her! Meghan!! I want your ripped jeans back and your messy bun....pleaaaase!!! People of colour come in too many shades, in particular biracial people, for manufacturers of stockings to be able to match the skin tone perfectly. In many cases the face is darker because it gets the most sun. Sometimes it is better to match the outfit with sheers in the same colour rather than the skin tone. In addition, the camera sometimes distorts colours. It's never going to happen Beth. I remember saying how long will it take until she starts to look like another Stepford wife.... Well I think it's now! Oh yes those ripped jeans and messy bun and maybe that boyfriend shirt would have went so well at this garden party. The California girl brings her California style to Britain. I hope I never see those ripped jeans again and that awful messy hair! Time she acted and dressed like a royal since she worked so hard to get her prince. By the way, did you see the video of her walk as they left the garden party? Something to behold. This is the hairstyle she should have worn at her wedding. I like the hat. It's not a beret. And I finally like an outfit she wore. Maybe she was waiting to become a Duchess before dressing like a royal instead of an actress. I hope people here are not going to be cruel to her about every choice she makes. Just put yourself in her shoes and see how well you would cope with the constant appraisal and criticism. Already people are saying her dress is to big(???) and her hose to light... Next they will be saying she carries her bag like Catherine did.... I think she looks wonderful and is a great addition to the family. I don't think it is "cruel" to say her dress is too big. Another, anonymous poster said that they saw "nothing special" in her. To me, that is a nasty thing to say about anyone. There is something special in everyone, let alone the fabulous Meghan Markle. But this is a fashion blog, where people must feel free to state their opinions on fashion choices. I agree that her tights are the wrong colour, needs a darker shade. Also, the dress colours are reversed on the model... those colours might have suited her better. I thought that her morning wedding dress was too loose (needed another final fitting perhaps?) and now I'm seeing that here too. The dress doesn't look so svelte. The unexpected stresses of those days just before the wedding could well have caused some weight loss. Otherwise, I credit her for the style and for this, her first official hosting function with senior Royals, and for the first time this kind of formal Royal event. I'm hoping we will see more of that quirky, contemporary style in future months when she and/or Harry attend other less formal engagements, and she has struck a good style balance with her stylist. Wow, sie sieht wunderschön und sehr elegant aus. Ich liebe dieses Paar. Tidy hair, finally! That looks good. But the pantyhose looks awful, the dress is okay, nothing special. Wow, this whole look is perfection, a flawless sartorial debut in her new role as a duchess. Nothing "edgy", just lovely and dignified, with the hat bringing just the right touch of panache. I'm impressed. Stepford wife in the making 😯 ??? Meghan, please don't, we want your individual style, we want your messy bun, we want your ripped jeans. We don't need another morphed royal lady. You look almost like Camilla!!! Please don't do it. Just please! unfortunately Beth she is not in America any more. its a different culture, a duchess has to dress a certain way. I understand what you mean, Beth. Not much of Meghan here in this look. BTW: I agree with those who say this hairdo would be more appropriate for the weding. How can se appear at a garden party with rippe jeans. Ridculous comment. Typical Beth comment. OMG! You kill me. So "Clutching the Clutch" is to the british royals what the aspidistra plant was to the british middle class in the first quarter of the past century: Keep the Aspidistra Flying! Beth, you're a crack. I understood what you meant Beth and I agree with you. I found the transformation too soon and quite startling. 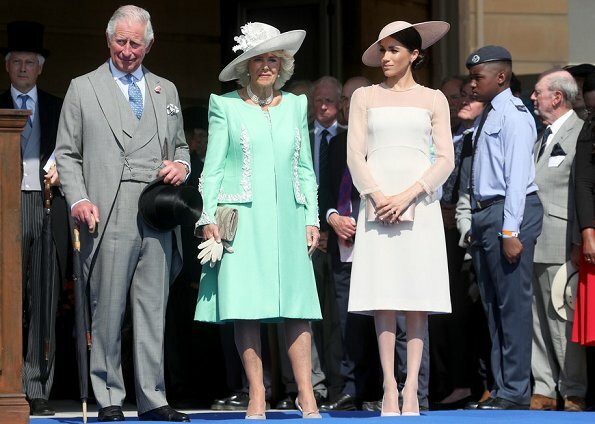 However, I fully understand this outfit for a large public event involving Senior Royals such as Charles and Camilla, and agree with it. Better safe than sorry. I also believe that since she is now very likely under the advice and rules of a Royal stylist, she is obliged to wear and test styles outside her norm, that are in keeping with the rules. Expect to see more of this in the months ahead. But as I also mentioned in my post up above (May 22nd, 11.24pm) I too look forward to more of her own pre-wedding youthful, contemporary style once she has had more experience in her new role and responsibilities and duties, and has figured out a forward style strategy with her stylist, that combines what is required and her personal individuality. Being a Duchess - especially a young and vibrant one as she is, who is going to be working a lot with youth, especially in the commonwealth where there are no duchesses and you don't want to come across as 'hoity-toity' - doesn't mean that you always have to be or look regal or stuffy. I'm looking forward to seeing what how she evolves her own style. This British Royal HOUSE protocol. When you married into this Royal Houze you follow protocol and Meghan received and trained in protocol. So a day or 20 years part of this family you follow protocol. 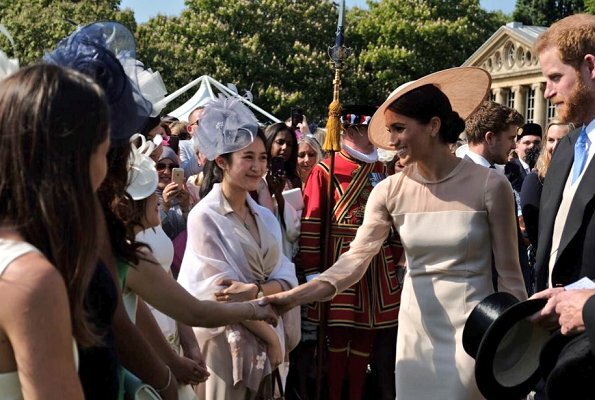 you would think new Royals from commoner backgrounds might recieve encouragement , since it must be a hard adjustment to make We should just allow Meghan to find her way . I agree with the picking. I thought her look was perfection and darker hose would have looked odd with such a pale ensemble. You want her ripped jeans at an event like this? Sorry, but she will change in some ways. There's no option, but I'm sure her personality will still shine through. Why is it that any woman who joins a royal family has to go through the picky comments? I personally like this look on her, the dress does not look too big and the color looks great on her. Everything about this outfit works as far as I am concerned. She is dressing for her role now and I think she did a great job of it. Wow. I just can't believe some of the comments here. It seems like no matter what she wears, one will find something not to like. Before people complain that she wears too many black or dark color, now she appears in this color and still some will say it doesn't suit her. Her hair is now in this sleek bun and now you want her messy hair back saying this is not her style. I completely agree with you! No matter what Meghan does she is criticized. Give the woman some break! I think she looked wonderful! People are imploring others not to criticize? Is this the same crowd that usually criticizes Queen Maxima for her hair and the Duchess of Cambridge for her Erdem fixation? The hat and purse were wonderful. It was nice to see the hair done up nicely. i say you go girl, some say harsh things when she was more of a laid back style, now some still say harsh things about her refined style, so its never enough for someone else irrelevant. She will be pregnant by Christmas and then she will need all those baggy dresses haha! Wow, starting in on Meghan already! Its a nice dress with classic tailoring. Its the right size, maybe a little snug around the rear. The problem is the ironing, or the way she was sitting on the skirt while in the car. Camilla is wearing one of my favorite colors, so I think that dress is alright, too. I think its great how they can fashionably not squint and not wear sunglasses in that sunlight. p.s. I like the hat and I think she should a dozen; cover the color spectrum. Agree. One for me too, please (any colour)! I think meghan is lovely. Her dress and hat suits her. Lovely make up as well, very appropriate for a garden party. The dress was custom made for her according to the brand so i guess that is how the dress supposed to fit. Lovely meghan. Keep on smiling. Wow, einfach wunderschön und sehr elegant. Ich liebe Meghanś Stil und ich liebe dieses Paar. Duchess Meghan is very elegant but I miss a bit of the "real" Meghan. I love her style and I hope she does not will change it after the wedding. 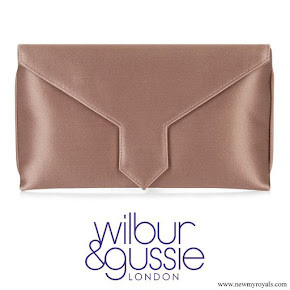 Always the clutch in front of the body - Kate and now Meghan too? Please not! She looks amazing - beautiful posture. Ripped jeans and messy hair at a Buck Palace garden party when the men are in morning dress - are you serious? She's supporting the Queen in an important function at the Queen's palace. None of us really knows what it's like behind closed doors, but she'll be receiving the full support of the retinue of advisors now she's "in", and a wardrobe paid for by the Duchy of Cornwall (via Prince Charles). Of course she'll be taking cues from them until she feels comfortable. She was quite capable of making a statement at her own wedding. She's showing respect to the Queen. I don't understand some comments. 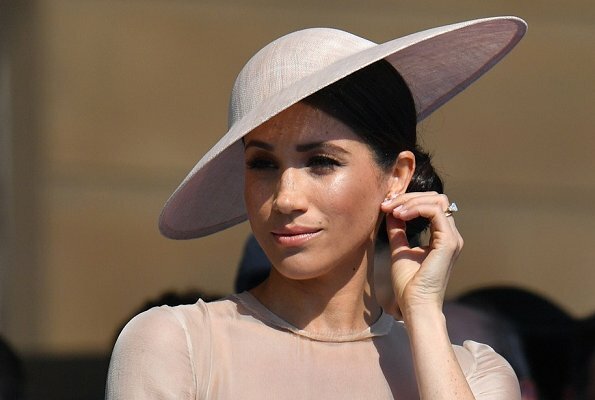 Megan, Duchess of Sussex, has to find her role. May be this dress is a little bit too much different to her usual look, but what do people expect? That she changes the world - as said from some gossip writers? Ridiculous! Hopefully the point of view of some aspects will change. Even Obama, President of the United States, couldn't change the world. It only changes it small steps, everything else is Hollywood. This amazing marriage is one step but which doesn't decide the yellow press. Why are they not on honeymoon? Why are Harry and Meghan not on honeymoon ? The women has style-end of story! Both couples looked grand,for Meghan not one hair out of place. Hope we see more. Duchess Meghan. Do not read this blog. You are now joining Grand Duchess Stephanie, Duchess Catherine, Princess Charlene, Princess Charlotte that the bazhing club could lash out. You are already trouble not inviting the crown princess victoria. Rememer she is the only stylish royalty. Dont follow her fashion you will bashed wearing your grandmother or queens old clothes. @Anna-Marie Punt, it is very obvious that until now you still do not understand what a fashion blog is about. I doubt that you know much about fashion. Your comments are always personal and emotional containing sideblows towards royal ladies that are not your favourites or towards other commenters. You are talking about bashing? There is only one person on this blog who keeps on bashing. That's you. een heel gelukkig stel, ik gun ze het zo !!!! Meghan looks lovely. 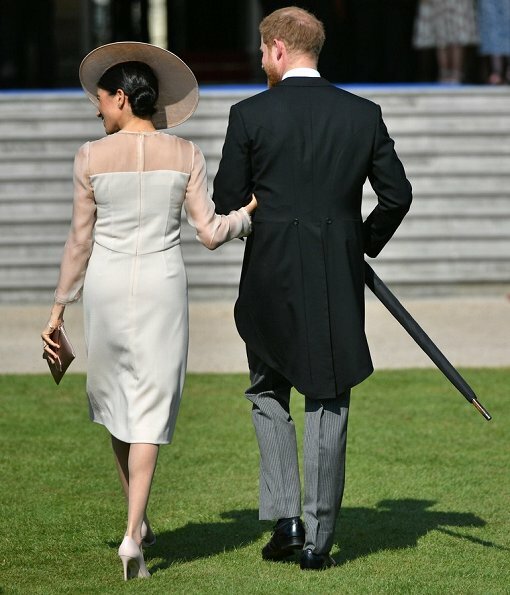 A very elegant and demure ensemble for her first official outing as the Duchess of Sussex.